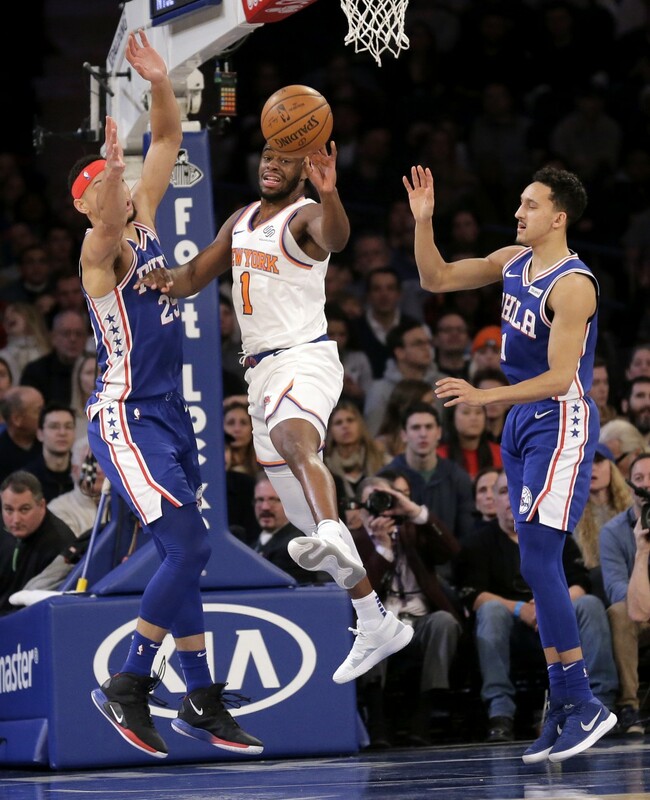 NEW YORK (AP) — Ben Simmons fell an assist short of a triple-double with 20 points and 22 rebounds, Joel Embiid scored 26 points and the Philadelphia 76ers escaped with a 108-105 victory over the New York Knicks on Sunday. New York's Emmanuel Mudiay missed a potential game-tying 3-pointer at the buzzer that would have sent the game into overtime. JJ Reddick had 22 points for the 76ers, who ended a two-game skid. 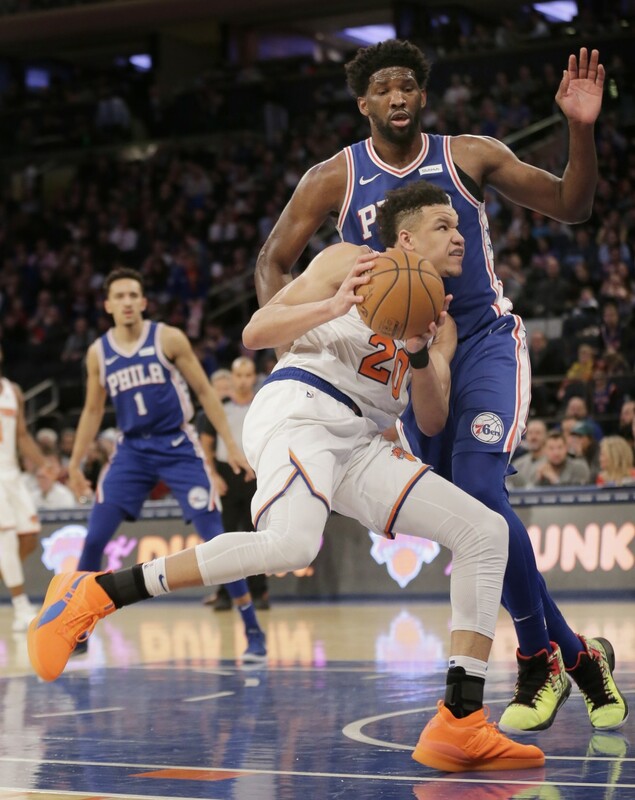 Philadelphia survived a scare after leading by as many as 24 points late in second quarter before New York charged back with a strong third period and closed the gap to 83-82 with 11 seconds left after Luke Kornet's jumper. 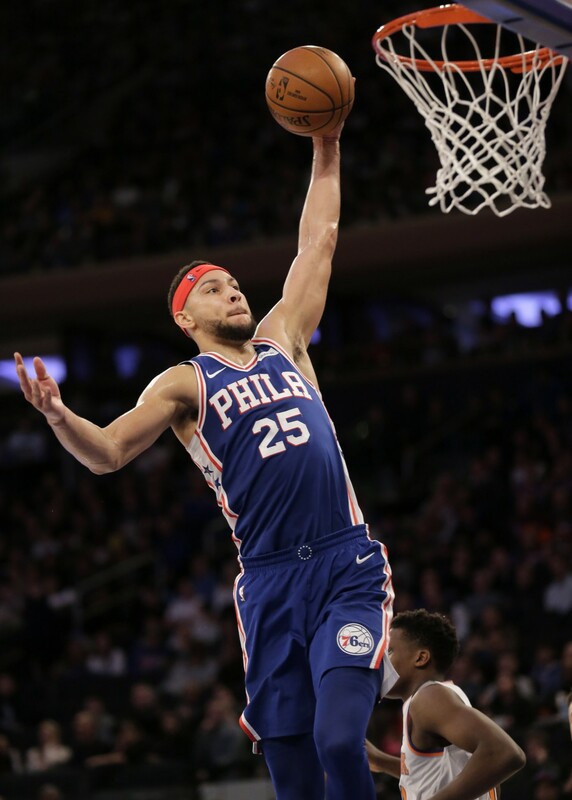 The 76ers recovered to start the fourth quarter and went on an 11-0 run capped by Jimmy Butler's driving layup that extended the lead to 94-82 with 6:22 left. Embiid hit a free throw that extended Philadelphia's lead to 108-103 with 9.3 seconds to go but then made the mistake of fouling New York's Damyean Dotson on a 3-point attempt. Dotson hit two of three free throws, cutting the deficit to 108-105. 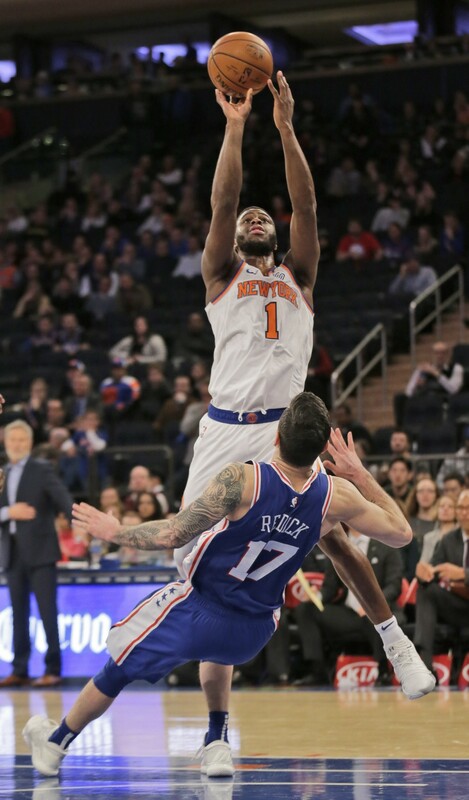 Mudiay grabbed the rebound and ran behind the 3-point line before his last second heave fell short. 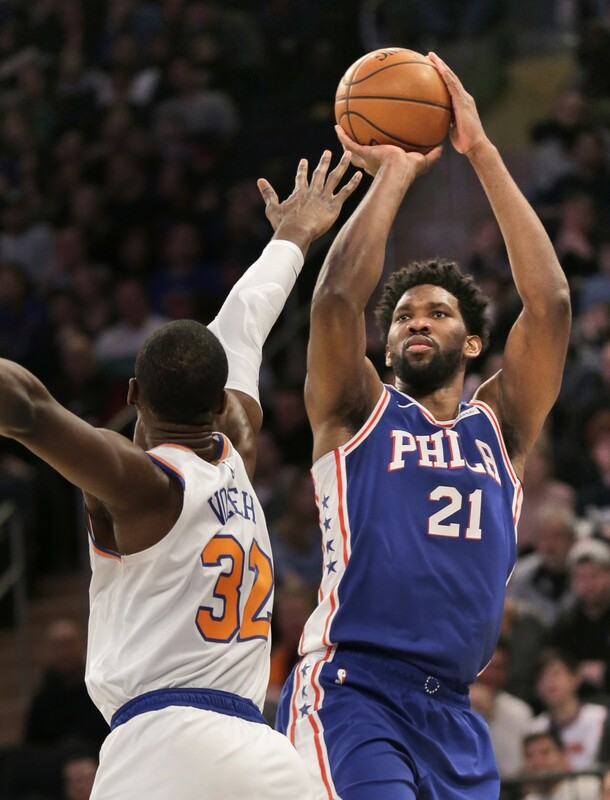 It was Philadelphia's seventh straight win over the Knicks. 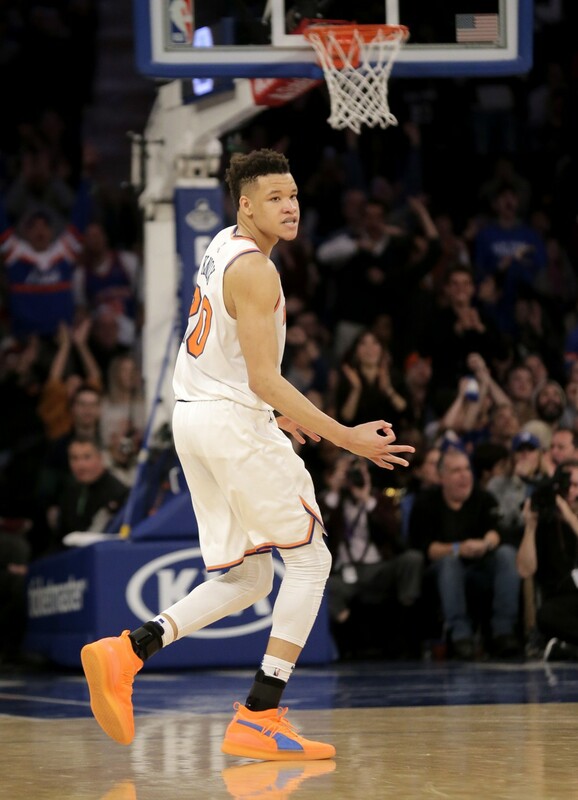 Kevin Knox scored 31 points for the New York, who have lost four straight and 19 of their last 22. The Knicks have lost eight straight at Madison Square Garden. Their last home win was Dec. 1 over Milwaukee. 76ers: C Embiid played 32 minutes in his return to the starting lineup after missing Friday night's home loss to Atlanta. Embiid, who suffered a sore left ankle Wednesday night at Washington, had eight rebounds and blocked six shots. Knicks: G Tim Hardaway Jr., who injured his left hamstring during Friday night's loss, did not play. . C Enes Kanter was held out because of what coach David Fizdale described as "flu-like symptoms". . G Frank Ntilikina played 28 minutes after missing his last three games because of a sprained left ankle. He had eight points and six assists. 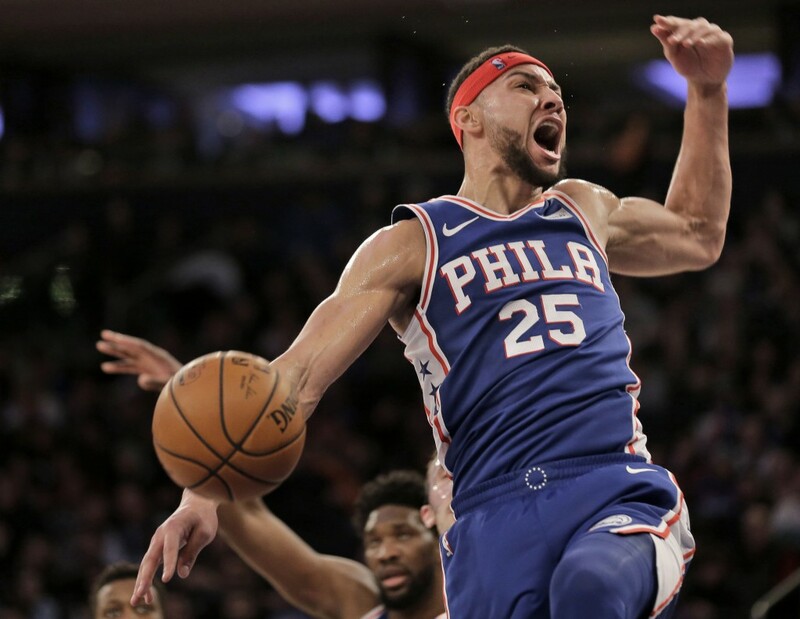 With the 76ers leading by 18 points late in the first quarter and again in the second period, Philadelphia fans visiting Madison Square Garden broke into an "E-A-G-L-E-S Eagles!" chant in support of the NFL's defending champion Philadelphia Eagles, who play later Sunday in a divisional round playoff game at New Orleans. 76ers: Host the Minnesota Timberwolves on Tuesday night. Knicks: Will play the NBA's ninth regular-season game in London when they face the Washington Wizards. It is New York's third game in England.